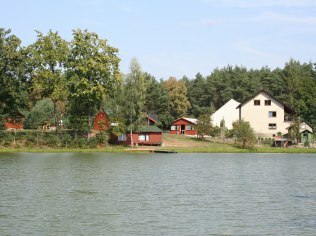 The agrotouristic farm Stary Młyn occupies a large area (40 ha), located on the river, among ponds, forests, fields and meadows. It is located in Krasiejów, five kilometers from the center of the village. You can rest here in the bosom of nature, away from the city noise. ACCOMMODATION We offer accommodation in year-round cottages. As part of the stay, guests have the option of kayaking on the ponds or using the volleyball court. One of the attractions is also an exhibition of various interesting items related to the history of the region. We invite you to accommodation in cottages at any time of the year. On hot days, you can cool off under a waterfall. PLENER EVENTS, PHOTOGALLERY There is a possibility of renting the area to organize various types of outdoor events, as well as photo sessions. Gospodarstwo Stary Młyn took first place in the Agro-Eco-Tourist Competition Green Summer 2017 in the category of the best agricultural farm in the region where agritourism services are an additional source of income; subcategory: the best agritourism farm.Ladies and gentlemen! For organizational reasons, please contact us by phone, not by written inquiry. Thank you! Accommodations Krasiejow, you are looking for accommodation in Krasiejow via social networking tourist site e-turysta.com. Our accommodation database in Krasiejow contains offers from every district of the city. Private rooms in Krasiejow, private lodgings, cheap accommodation in Krasiejow and other inexpensive proposals to spend a weekend. For those wishing to explore Krasiejow in some more luxurious conditions, we offer accommodations in Krasiejow in luxury apartments and best hotels. Krasiejow accommodations and cheap private rooms in Krasiejow. Private rooms in Krasiejow, private lodgings, e-turysta.com provides you with recent attractive ideas for accommodation in Krasiejow. Don't miss the promotions, and remember, if you want an accommodation in Krasiejow, we are the best choice! Krasiejow private rooms, accommodation Krasiejow for every budget. Thanks to our advanced search you can find accommodation in Krasiejow that will live up to all your expectations.